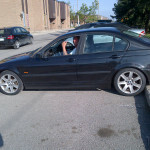 Our long term client with his BMW. Click on the thumbnail to view bigger photo. We have some clients with high km in their BMW. Some of them way over three hundred thousand and one with nearly four hundred and fifty thousand kilometers of daily driving. With proper maintenance, proper oil change these German Import Cars can serve you and your family for a long time. On the first photo, you can see the vehicle and it’s proud owner. We have been looking after this vehicle for over ten years. 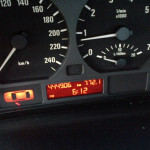 On the second photo is the odometer.